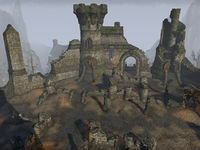 Traitor's Tor is a battlefield in eastern Rivenspire, east of Shornhelm. The tor is where King Ranser made his last stand against the Orcs of Wrothgar at the climax of Ranser's War. Traitor's Tor Objective: Discover the true fate of King Ranser. This page was last modified on 19 November 2018, at 05:37.